Pre-orders for our next shipment are moving fast. Already 30% of the shipment has been taken with only 2 weeks to go before they land in Australia. Be sure to get in quick if you want to reserve your quality interlocking mats from this order and they are sure to disappear quickly. 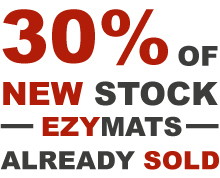 Ezy mats – “The gym mats you can trust”.